Created with a distinctive blend of American grown grade-A tobacco, Freeland Pipe Tobacco is produced with the highest quality Burley and Virginia tobacco leaves cured carefully and blended together allowing for an easy slow elegant burn with a rich full-bodied flavor and aroma that’s true to traditional pipe and smoking connoisseurs. The best way to use Freeland Pipe Tobacco is packed nicely inside your favorite smoking pipe. Whatever you fancy, Freeland Pipe Tobacco will deliver a satisfying smoking experience each and every time. Freeland Pipe Tobacco is distributed nationwide by Ohserase Manufacturing, LLC Akwesasne, NY located on the Akwesasne Mohawk Indian Reservation. 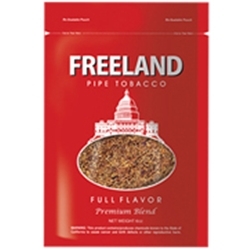 Each pouch of Freeland Pipe Tobacco are available at our online tobacco store in 3 unique styles to choose from. Full Flavor, Light, and Menthol. Choosing this premium tobacco is a great alternative to expensive and over-priced retail brands. Here at Smokers Discounts we’ve made it easy and affordable to buy pipe tobacco online. Call us for more details!